Some foods that are perfectly safe for humans or other pets can be dangerous for your kitties! Chocolate -- just like chocolate is dangerous for dogs, it is dangerous for cats. Theobromine in chocolate can affect the heart and nervous system. Onions -- compounds in onions can damage red blood cells and cause anemia. Cats are more susceptible to onion poisoning than dogs are. Garlic contains less of these compounds than onions do, and is less toxic. Coffee/Tea/Soda -- anything with caffeine can affect the heart and the nervous system. Fruit pits/Fruit seeds -- can contain trace amounts of cyanide and are also a choking hazard. Grapes and Raisins -- can cause kidney damage. Grapes are also a choking hazard. 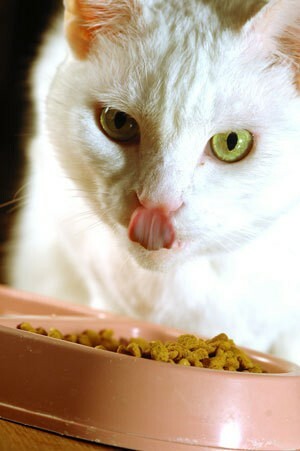 Iron -- if your cat gobbles your vitamins, they may be at risk for iron poisoning. Iron can damage the digestive system, including the liver and kidneys. Liver -- too much liver can affect muscles and bones. Macadamia nuts -- a compound in macadamia nuts can cause temporary paralysis in dogs; it can affect the digestive and nervous systems in cats. Mushrooms -- some kinds of mushrooms can affect multiple systems in your cat, leading to shock. It is best to avoid giving your cat mushrooms entirely! Raw eggs and raw fish -- can cause imbalances if fed too frequently. Raw eggs may also contain salmonella. Yeast dough/Bread dough -- dough continues to rise in the digestive system, causing pain or possibly rupture of the stomach or intestines. A byproduct of dough rising is alcohol. If you believe your cat has been exposed to something poisonous, stay calm. Call the veterinarian and warn them that you are on your way in with a suspected poisoning. Tell them what your cat ate, how long ago, and what the symptoms are. If you can, bring the container that held the dangerous food, and gather up a sample of what your cat has thrown up or passed. These things may help your veterinarian determine exactly what poisons are involved in your pet's illness. If you can't get to a veterinarian quickly, call the ASPCA Animal Poison Control Center at 1-888-4-ANI-HELP. The hotline is available twenty-four hours a day, every day of the year. There is a small fee for the service. Whenever I had cats and dogs, we always gave them the "juice" from the canned tuna. They would all line up and wait for their turn. It was never a lot at one time but I did make tuna salad every week -- using six small cans. All our pets lived a long life. I would like to know if there is a problem with giving them canned tuna. Does anyone know this to be true? Thanks. I was told by my vet to NEVER, NEVER give tuna to cats regardless how much they beg for it. He told me how tuna contains compounds that causes serious kidney dammage and can eventually cause kidney failure. Nothing breaks his heart more than when he has to put a cat down for end-stage renal failure because their owners were giving them 'something special' out of love. Tuna flavored treats like Pounce are perfectly fine as if they actually contain tuna, the compounds have been processed out. As for giving them just the tuna juice, my vet said that your cats were unbelievably lucky to live their long lives. Giving them just the juice, he says, is no better than giving them the tuna. It causes the same dammage. I had a cat who got poisoned by PineSol on his feet. Poison Control told us to give him tuna water... and he survived! I also gave him plain yogurt! I have always treated my kitties with tuna & the water... but not consistent diet of it! Everything in moderation! The ASPCA recommends no more than 3 teaspoons a week of tuna as a treat.